We live in a world where the weather does not always favor the delicacy of the clothing we are wearing. The answer is the overcoat, a garment whose dual purpose is functionality, protecting you from the elements, and style, maintaining the professional look you seek to project. Fit is especially important for an overcoat; if it is too large (as most men tend to wear them), it will not effectively protect its owner from the cold. A properly cut custom overcoat can not only highlight a man’s physical strengths (athletic cut, broad shoulders), it can also be adjusted to be incredibly versatile (extra interior lining for warmth, working upper buttons and collar to protect the neck, etc.) 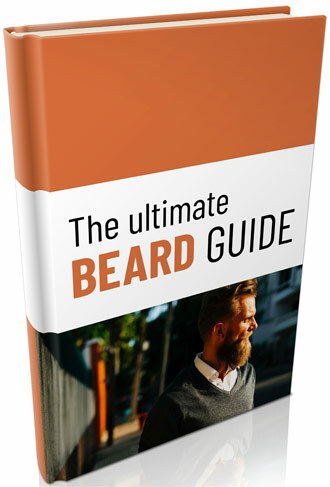 To learn more about men’s custom tailored overcoats, visit our style guide. 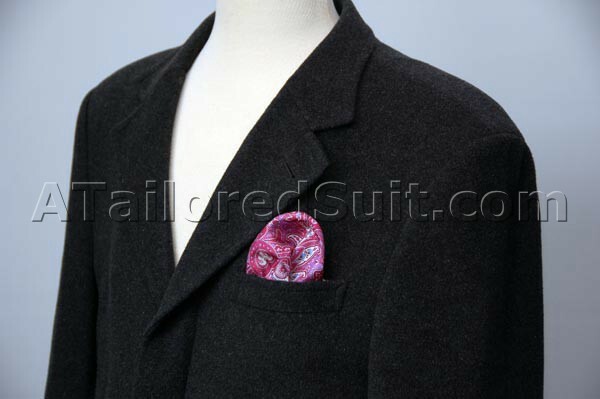 Below are pictures of one of our finished bespoke overcoats. 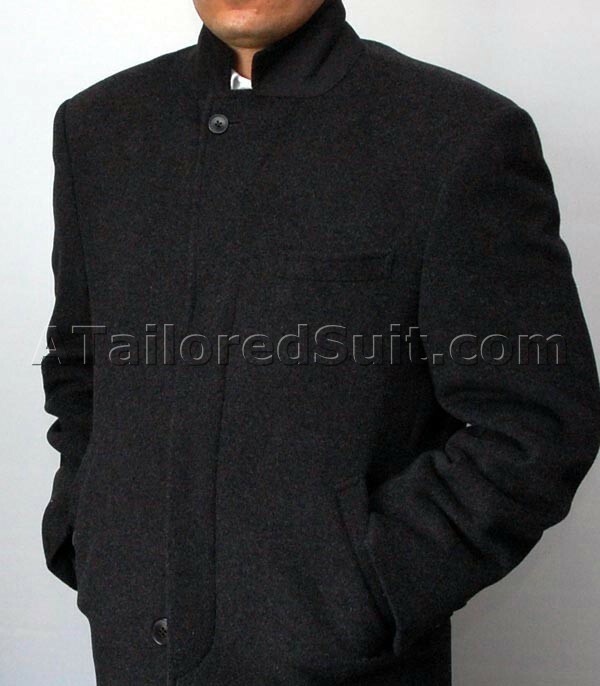 This men’s overcoat is crafted with fabric #7-7-7, its charcoal gray color an instant classic. Here we see a notched collar and left breast pocket with covered front buttons. 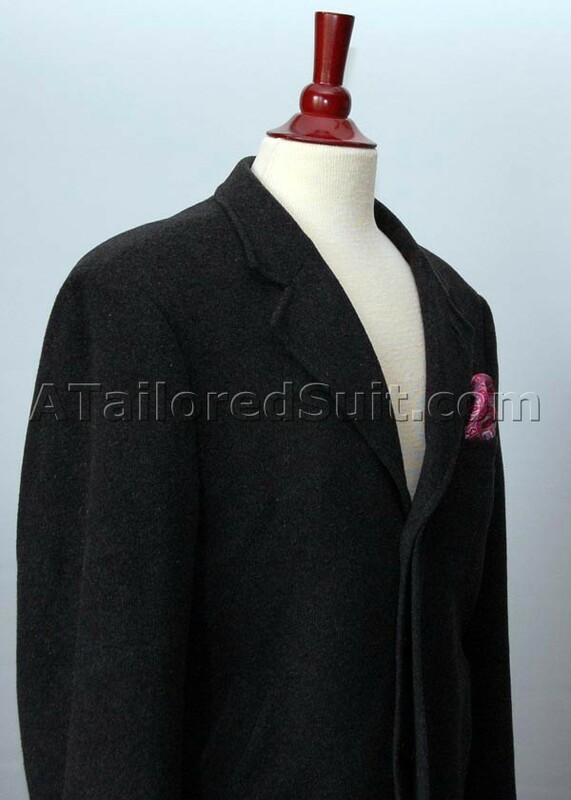 This view of the men’s overcoat allows us to see better the covered front buttons and the bare right breast pocket. Breast pockets are optional, but one is recommended so that you have the opportunity to add some color to your ensemble on a dreary winter day. In this photo we can see the overcoat’s fit. With hands down, the overcoat’s sleeves will extend far enough to cover the shirt sleeves but bend the arms up and the clothing underneath is slightly exposed. Also we can see here the sleeve buttons; as on all of our garments, the sleeve buttons are fully functional. Functionality is very important in a men’s overcoat; this garment not only needs to look good, but it has to protect you from the elements. Here we can see that the top buttons are fully functional and the collar easily folds up to protect the neck. Also, the hand pockets were placed perfectly so that the wearers hands could slide right in. Not visible, but available upon request are extras such as a heavier interior lining for those living in especially cold climates.